Raising NAD+ levels back to youthful levels to combat aging is an exciting new field of research. 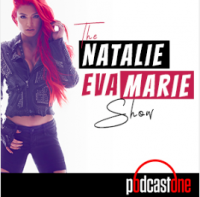 Supplementing with NAD+ precursors such as Nicotinamide Riboside and NMN are getting a lot of the attention, and recent research is proving it is effective. Rather than boosting NAD+ levels, an alternative and/or complementary approach seeks to remedy the cause of WHY NAD+ levels drop as we age. Recent studies have found the enzyme CD38 RISES at the same time NAD+ levels decline, and seems to destroy NAD+. They found that inhibiting CD38 results in much higher NAD+ levels. Other studies have found Flavonoids like Quercetin and Apigenin are effective at inhibiting CD38, resulting in higher NAD+ levels. Quercetin is a flavonoid and known anti-inflammatory agent (1) that has been shown to have beneficial effects against cancer (2), and atherosclerosis (3). It is found in many vegetable, tea, coffee and red wine. Quercetin supplements are highly bioavable with a half-life of 11-28 hours which means that supplementation results in greatly increased blood plasma levels. Quercetin is a natural product reputed and used traditionally for its beneficial effects on health. It is categorized as a flavonol, one of the six subclasses of flavonoid compounds. The name Quercetin is derived from quercetum (oak forest), after Quercus. 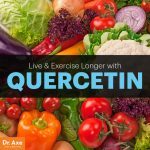 Quercetin has unique biological properties that offer potential benefits to overall health and disease resistance, including anti-carcinogenic, anti-inflammatory, antiviral, antioxidant, psychostimulant activities, capillary permeability and stimulation of mitochondrial biogenesis. Quercetin is present in various vegetables as well as in tea and red wine. In a typical Western diet the daily intake of quercetin is estimated to be in the range of 0 and 30 mg.
Quercetin is also one of the most complex flavonol compounds to understand due to its metabolism. It involves intestinal uptake and/or deglycosylation, glucuronidation, sulfation, methylation, possible deglucuronidation and so on. From the various quercetin metabolites generated in the body it has been recently demonstrated that quercetin “3-O-β-D-glucuronide (Q3GA)” and quercetin “3′-sulfate” are the dominant quercetin conjugates in human plasma. Typically, the human quercetin plasma concentration is in the order of nanomolar, but upon quercetin supplementation it may increase upto the low micromolar range. This together with a half-life of the atom and its metabolites in the range of 11-28h it can be assumed that continuous supplementation leads to an increased plasma concentration. In human studies, quercetin has been mostly well tolerated. Doses up to 1,000 mg/day for several months did not produce adverse effects on blood parameters, liver and kidney function,hematology, or serum electrolytes. In general, there is plentiful available evidence that support the safety of quercetin for addition to food. A few items should be noted however. At high dosing, quercetin has been shown to inhibit topoisomerase II which is an essential enzyme in DNA replication and inhibition leads to diplochromosomes. These results have led to some questioning the usefulness of quercetin as this introduces for example a possible risk of liver cancer while other studies find that this same property has anti-cancer treatment qualities. The second note is with regards to other drug interactions. Due to is complexity it may interfere with these prescription medications. An ingredient that burns BIG amounts of fat… even if you’re just sitting down! … and could start making a HUGE difference in people’s lives sooner than you think. You may have heard of this before. 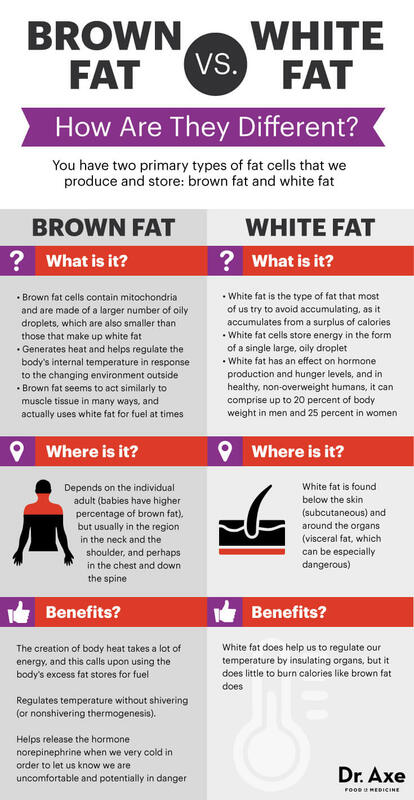 Brown fat is the incredible “permanent fat” that keeps you warm by using your regular calorie-packed fat as fuel. 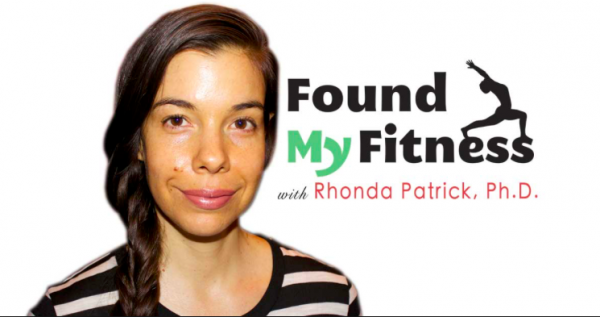 So can activating Brown fat work on YOU? And cutting-edge research now shows activating this tiny amount of “helpful” fat could work on HUMANS at any age. 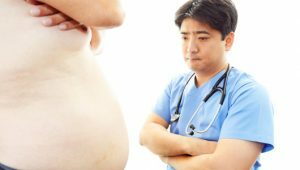 So to test this, researchers from the elite University of Sherbrooke “activated” the Brown fat of healthy human subjects. That’s right — by activating their own Brown fat, the human subjects nearly DOUBLED their fat-burn… by just sitting there. 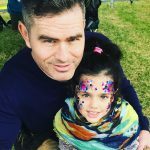 So how can you start feeling the powerful effects of Rutin? And conveniently, this potent berry is available everywhere — so you can start feeling the powerful effects of Rutin right now. I’d say the best thing to do is go stock up on mulberries at your local grocery store. Not all mulberries are the same. In fact, the mulberries with the highest levels of healthy vitamins, antioxidant content, and Rutin are the mature, dark berries. So when you’re at the grocery store DO NOT get the hard, colorless mulberries. Because they aren’t RIPE and won’t give you nearly as much good stuff as the dark, mature mulberries! This June 2016 study shows that CD38 increases dramatically with age and plays a key role in destroying Nicotinamide MonoNucleotide (NMN), a NAD+ precursor. The authors show that protein levels of CD38 increased in multiple tissues during aging. They then compared the relationship of CD38 levels to NAD+ of normal mice vs CD38 Knockout mice (Mice bred without the gene to product CD38). 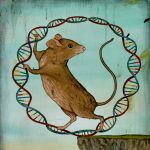 The NAD+ levels of normal mice aged 32 months are about 1/2 that of young mice, whereas the CD38 knockout mice showed no decrease in NAD+ levels at the same age. This study did not suggest a cause for the rapid increase in CD38 activity but other studies have shown a link to CD38 increase with inflammation from disease and injury as we age. 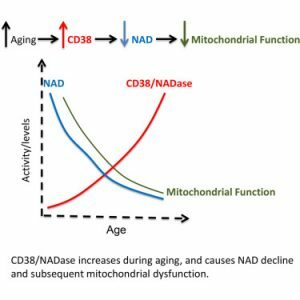 The exponential rise suggests that CD38 may deplete NAD+ needed for other processes and directly relate to the aging process. Finally, the authors addressed how CD38 may affect therapies designed to raise NAD+ levels. 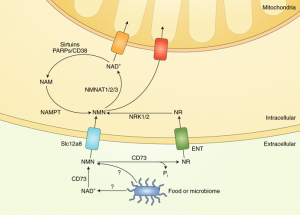 Currently, the favored approach in mouse and humans is to treat with NAD+ precursors, such as nicotinamide riboside (NR) or nicotinamide mononucleotide (NMN). Interestingly, CD38 not only degrades NAD+ in vivo, but also NMN. 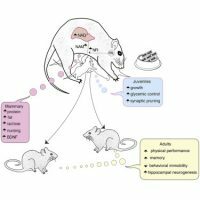 When CD38 knockout mice were given injections of NAD+, NMN, or NR (which is converted to NMN), circulating levels of NAD metabolites remained stable after 150 min, long after they began to fall in the wild-type animals. Furthermore, when compared to the wild-type, CD38 knockout mice on a high-fat diet exhibited a much larger improvement in glucose tolerance when given NR. Prior research shows that declining NAD+ levels is linked to many age related diseases and metabolic disorders such as diabetes, and a possible contributing factor to aging (4). 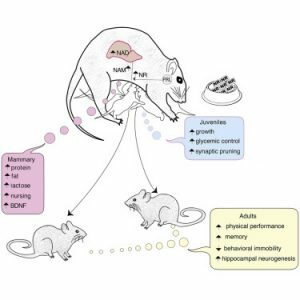 A landmark 2013 study by Dr David Sinclair demonstrated that increased levels of NAD+ have been shown to reverse age related degeneration in mice, giving older mice the muscle capacity, endurance and metabolism of much younger mice (5). 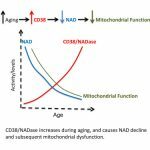 This suggests that many of the the normal age related conditions are at least partly driven by decreased mitochondrial functioning, and that increasing NAD+ levels can restore mitochondrial functioning and reverse many age related problems (9). 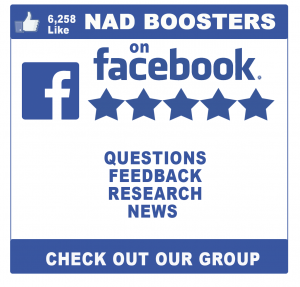 Conclusion: Top researchers have been investigating raising NAD+ levels for treatment of disease and degenerative aging. While many of the health benefits of Quercetin are well documented, the mechanisms of action are not completely understood. In this study published April 2013, obese mice that received Apigenen or Quercetin showed improved glucose homeostasis, glucose tolerance, and lipid metabolism. The authors theorized the mechanism may be the anti-inflammatory properties inhibit CD38 which results in increased NAD+ levels in tissues. 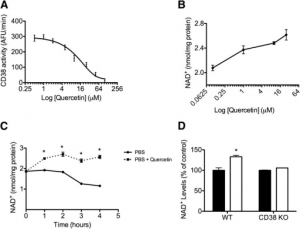 First, they measured the effect of quercetin on endogenous cellular CD38 activity and found that quercetin promotes an increase in intracellular NAD+ in a dose-dependent manner (Fig. 4B). They also compared NAD+ levels of normal mice with CD38 knockout mice after supplementation with Quercetin and found it promotes an increase in NAD+ in normal mice but does not further increase NAD+ levels in CD38 knockout mice (Fig. 4D), indicating that the effect of quercetin on NAD+ levels is CD38 dependent. They were able to demonstrate that Quercetin inhibits CD38 and promotes an increase in NAD+ levels. Conclusion: The researchers concluded that apigenin and quercetin as well as other CD38 inhibitors may be used to raise NAD+ levels and treat metabolic syndrome and obesity-related diseases. Supplementation with NAD+ precursors such as Nicotinamide Riboside is generating a lot of excitement as recent research is proving it is effective at raising NAD+ levels in humans, which has tremendous therapeutic potential to treat metabolic and age-related disease. 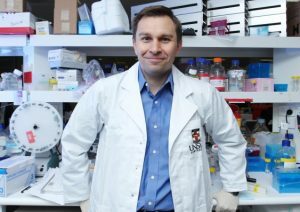 Dr Sinclair is at the forefront of research on NAD+ levels and their effects on aging. 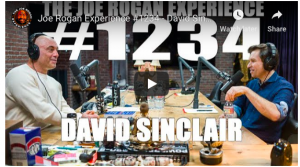 In this video (18 minute mark), he demonstrates recent research supplementing with NAD+ precursors to return old mice to youthful states. Results from these and other studies with CD38 demonstrate that combating the rise of CD38 is also a promising approach to protect NAD+ levels. Several epidemiologic studies have indicated that coffee consumption has a neuroprotective effect against Parkinson disease (PD) and Alzheimer disease (AD). Liu et al. (2012) analyzed 304,980 participants in the National Institute of Health (NIH) study and found a mild protective effect of coffee against PD. Palacios et al. (2012) found a similar effect in a smaller cohort, again attributing it to caffeine intake. Qi and Li (2014) did a meta-analysis of 13 articles on coffee, tea, and caffeine consumption and concluded there was a linear dose-response effect reaching a maximum at approximately 3 cups of coffee per day. As far as AD is concerned, Eskelinen and Kivipelto (2010) reported that caffeine and other factors in coffee were possible protective factors. On the basis of the Cardiovascular Risk Factors, Aging and Dementia study they concluded that drinking 3e5 cups of coffee at midlife was associated with a decreased risk of dementia/AD of about 65% in late life, and this was due to caffeine and/or other mechanism such as antioxidant capacity by other components. Eskelinen et al. (2009) showed that drinking 3e5 cups of decaffeinated coffee at midlife decreases the risk of AD. Epidemiologic studies indicate that coffee consumption reduces the risk of Parkinson’s disease and Alzheimer’s disease. To determine the factors involved, we examined the protective effects of coffee components. The test involved prevention of neurotoxicity to SH-SY5Y cells that was induced by lipopolysaccharide plus interferon-g or interferon-g released from activated microglia and astrocytes. We found that quercetin, flavones, chlorogenic acid, and caffeine protected SH-SY5Y cells from these toxins. They also reduced the release of tumor necrosis factor-a and interleukin-6 from the activated microglia and astrocytes and attenuated the activation of proteins from P38 mitogen-activated protein kinase (MAPK) and nuclear factor kappa light chain enhancer of activated B cells (NFkB). After exposure to toxin containing glial-stimulated conditioned medium, we also found that quercetin reduced oxidative/ nitrative damage to DNA, as well as to the lipids and proteins of SH-SY5Y cells. There was a resultant increase in [GSH]i in SH-SY5Y cells. The data indicate that quercetin is the major neuroprotective component in coffee against Parkinson’s disease and Alzheimer’s disease. Attributing these effects to caffeine in coffee was recently challenged by the findings of Ding et al. (2015). They examined the effects of consuming total, caffeinated, and decaffeinated coffee in 3 very large cohorts of men and women. They found significant inverse associations with coffee consumption and deaths attributed to cardiovascular disease, neurological diseases, and suicide. There was no significant difference between consuming caffeinated or decaffeinated coffee. This latter report indicated that other constituents of coffee than caffeine must be responsible for the protective effect. For example, flavonoids are polyphenolic bioactive compounds that are found in foodstuffs of plant origin (Babu et al., 2013). Flavonoids are classified into subgroups based on their chemical structure: flavanones, fla- vones, flavonols, flavan-3-ols, anthocyanins, and isoflavones. Flavonoids have a backbone of 2-phenylchromen-4-one (2-phenyl-1-benzopyran-4-one). Specifically, adding hydroxyl groups to the backbone generates flavonols including quercetin and flavones such as apigenin and luteolin. It is known that they functions generally to remove oxidant and to inhibit inflamma- tion (Marzocchella et al., 2011). In this report, we examined the effects of caffeine and other well-known coffee components, such as quercetin, flavone, and chlorogenic acids (CGAs), on neuroinflammation and neurotoxicity mediated by toxic factors from activated microglia and astrocytes. We also investigated changes in oxidative stress markers caused by quercetin and caffeine because depletion of glutathione (GSH) in glial cells induces neuroinflammation resulting in neuronal death (Lee et al., 2010a). 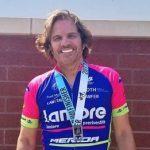 We found that CGA, flavone, quercetin, and caffeine reduced the release of proinflammatory cytokines such as tumor necrosis factor- a (TNFa) and interleukin-6 (IL-6) from lipopolysaccharide/inter- feron-g (LPS/IFNg)-stimulated microglia and THP-1 cells, as well as from IFNg-stimulated astrocytes and U373 cells. The toxicity was attenuated in a concentration and incubation-time dependent manner. This was due to reduced activation of intracellular inflammatory pathways such as P38 mitogen-activated protein ki- nase (MAPK) and nuclear factor kappa light chain enhancer of activated B cells (NFkB) proteins and decreased release of proin- flammatory cytokines such as TNFa and IL-6. We found that quer- cetin was the most potent anti-inflammatory and neuroprotective coffee component. In addition, quercetin has antioxidative prop- erties, but caffeine does not. The data indicate that quercetin, but not caffeine, is a major component reducing the risk of pathogenesis in degenerative neurological diseases such as PD and AD. It may prove to be a useful therapeutic agent. All reagents were purchased from Sigma (St. Louis, MO, USA) unless stated otherwise. The following substances were applied to the cell cultures: bacterial LPS (Escherichia coli 055:B5) and human recombinant IFNg (Bachem California, Torrance, CA, USA). The human monocyte THP-1 and astrocytoma U373 cell lines were obtained from the American Type Culture Collection (Manassas, VA, USA). The human neuroblastoma SH-SY5Y cell line was a gift from Dr R. Ross, Fordham University, NY, USA. These cells were grown in Dulbecco’s Modified Eagle Medium: Nutrient Mixture F-12 (DMEM/F12) medium containing 10% fetal bovine serum (FBS, Invitrogen, Carlsbad, CA, USA) and 100 IU/mL penicillin and 100 mg/mL streptomycin (Invitrogen) under humidified 5% CO2 and 95% air. Invitrogen). Human astrocytes from up to the fifth passage from 4 surgical cases were used in the study. For estimating the purity of astrocytic and microglial cell cul- tures, aliquots of the cultures were placed on glass slides at 37 C for 48 hours. The attached cells were then fixed with 4% para- formaldehyde for 1 hour at 4 C and made permeable with 0.1% Triton X-100 for 1 hour at room temperature. After washing twice with PBS, the astrocytic culture slides were treated with a mono- clonal anti-glial fibrillary acidic protein antibody (1/4,000, DAKO) and the microglial slides with the polyclonal anti-ionized calcium- binding adapter molecule 1 (Iba-1) antibody (1/500, Wako Chem- icals, Richmond, VA, USA) for 3 hours at room temperature. The slides were then incubated with Alexa Fluor 546-conjugated goat anti-mouse IgG antibody (Invitrogen, 1:500) and Alexa Fluor 546-conjugated goat anti-rabbit IgG antibody (Invitrogen, 1:500) in the dark for 3 hours at room temperature to yield a positive red fluorescence. To visualize all cells, the slides were washed twice with PBS and counterstained with the nuclear dye 40,6-diamidino- 2-phenylindole, dihydrochloride (DAPI) (100 mg/mL, Sigma) to give a blue fluorescent color. Images were acquired using an Olympus BX51 microscope and a digital camera (Olympus DP71). Fluorescent images were colocalized with ImagePro software (Improvision Inc, Waltham, MA, USA). The purity of microglia and astrocytes were more than 99% (2.54 ` 0.54 astrocytes in 500 total cells in micro- glial culture and 3.17 ` 0.62 microglia in 500 total cells in astrocytic culture, n 1⁄4 30). To achieve SH-SY5Y differentiation, the undifferentiated cells were treated for 4 days with 5-mM retinoic acid (RA) in DMEM/F12 medium containing 5% FBS, 100 IU/mL penicillin, and 100 mg/mL streptomycin (Singh et al., 2003). The RA-containing medium was changed every 2 days. Differentiated SH-SY5Y cells demonstrated neurite extension, indicative of their differentiation (Lee et al., 2013). Human astrocytes, U373 astrocytoma cells and THP-1 cells (5 105 cells), and human microglial cells (5 104 cells) were seeded into 24-well plates in 1 mL of DMEM/F12 medium con- taining 5% FBS. Caffeine, chlorogenic acid, quercetin, and flavones (Sigma, St. Louis, MO, USA) were then introduced at concentra- tions of 100 ng/mL to 1 mg/mL. The stock solutions were prepared with organic solvents; dimethyl sulfoxide (DMSO) for quercetin, caffeine, and CGA and acetone for flavone. Incubation of the mixtures was carried out for 2, 4, 8, or 12 hours. One set of cells was then incubated at 37 C for 2 days in the presence of in- flammatory stimulants. For microglia and THP-1 cells, the stimu- lants were LPS at 1 mg/mL and IFNg at 333 U/mL. For astrocytes and U373 cells, the stimulant was IFNg alone at 150 U/mL. A compa- rable set of cells was incubated in media without inflammatory stimulants. After incubation, the supernatants (400 mL) were transferred to differentiated human neuroblastoma SH-SY5Y cells (2 105 cells per well). The SH-SY5Y cells were incubated for further 72 hours, and MTT assays were performed as described in the following section. U373 cells that had been activated for 2 days with the inflammatory stimulants previously described. The subsequent procedures were the same as in protocol 1. The viability of SH-SY5Y cells after incubation with glial cell supernatants was evaluated by 3-(4,5-dimethylthiazol-2-yl)-2,5- diphenyltetrazolium bromide (MTT) assays as previously described (Lee et al., 2011). Briefly, the viability was determined by adding MTT to the SH-SY5Y cell cultures to reach a final concentration of 1 mg/mL. After a 1 hour incubation at 37 C, the dark crystals formed were dissolved by adding an SDS/DMF extraction buffer (300 mL, 20% sodium dodecyl sulfate, 50% N, N-dimethylformamide, pH 4.7). Subsequently plates were incubated overnight at 37 C, and optical densities at 570 nm were measured by transferring 100 mL aliquots to 96-well plates and using a plate reader with a corre- sponding filter. Data are presented as a percentage of the values obtained from cells incubated in fresh medium only. Cytokine levels were measured in cell-free supernatants after 48-hour incubation of THP-1 cells, U373 cells, microglial cells, and astrocytes. The cell stimulation protocols in these experiments were the same as that used in protocol 1. Quantitation was per- formed with enzyme-linked immunosorbent assay (ELISA) detec- tion kits (Peprotech, NJ, USA) following protocols described by the manufacturer. Western blotting on cell lysates was performed as described previously (Lee et al., 2011). Briefly, microglia and astrocytes were exposed to quercetin and caffeine at 10 mg/mL each for 8 hours and were subsequently exposed to stimulants for 2 hours. Human microglia and astrocytes were treated with a lysis buffer (150 mm NaCl, 12 mm deoxycholic acid, 0.1% Nonidet P-40, 0.1% Triton X-100, and 5 mm Tris-EDTA, pH 7.4). The protein concentration of the cell lysates was then determined using a BCA protein assay reagent kit (Pierce, Rockford, IL, USA). Proteins in each sample were loaded onto gels and separated by 10% sodium dodecyl sulfate-poly- acrylamide gel electrophoresis (SDS-PAGE) (150 V, 1.5 hours). The loading quantities of lysate proteins were 100 mg. Following SDS- PAGE, proteins were transferred to a polyvinylidene fluoride membrane (Bio-Rad, CA, USA) at 30 mA for 2 hours. The mem- branes were blocked with 5% milk in PBS-T (80 mm Na2HPO4, 20 mm NaH2PO4, 100 mm NaCl, 0.1% Tween 20, pH 7.4) for 1 hour and incubated overnight at 4 C with a polyclonal anti-phospho- P38 MAP kinase antibody (9211, Cell Signaling, Beverly, MA, USA; 1/2000) or anti-phospho-P65 NFkB antibody (3031, Cell Signaling; 1/1000). The membranes were then treated with a horseradish peroxidase-conjugated anti-IgG (P0448, DAKO, Mississauga, Ontario, CA, USA; 1:2000) or the secondary antibody anti-mouse IgG (A3682, Sigma, 1/3000) for 3 hours at room temperature, and the bands were visualized with an enhanced chemiluminescence system and exposure to photographic film (Hyperfilm ECL, Amer- sham Biosciences). Equalization of protein loading was assessed independently using a-tubulin as the housekeeping protein. The primary antibody was anti-a-tubulin (T6074, Sigma, 1/2000) and the secondary antibody was anti-mouse IgG (A3682, Sigma, 1/ 3000). Primary antibody incubation was overnight at 4 C, and the secondary antibody incubation was for 3 hours at room temperature. The GSH level was assessed by the method of Hissin and Hilf (1976) and Lee et al. (2010a). This assay detects reduced GSH by its reaction with o-phthalaldehyde at pH 8.0. Cells (106) in 1.5-mL tubes were washed twice with PBS, and 200 mL of 6.5% trichloro- acetic acid (TCA) was added. The mixture was incubated on ice for 10 minutes and centrifuged (13,000 rpm, 1 minute). The superna- tant was discarded, and the pellets were re-suspended in 200 mL of ice-cold 6.5% TCA and centrifuged again (13,000 rpm, 2 minutes). Supernatants (7.5 mL) were transferred to 96-well plates containing 277.5-mL phosphate-EDTA buffer (pH 8.0) in 1 M NaOH solution. Then 15 mL o-phthalaldehyde (1 mg/mL in methanol) was added. The reaction mixture was incubated in the dark at room tempera- ture for 25 minutes. The fluorescence at 350 nm excitation/420 nm emission was measured in a multiwell plate reader. The concen- tration was calculated from a standard curve using serial dilutions of reduced GSH. The concentration was expressed as mmol/g protein. Protein carbonyl content was determined by a modification of the procedure of Lyras et al. (1996). Cells (3 106) were lysed with a buffer containing 0.2% Triton X-100, 60 mL of protease inhibitor cocktail, and 1 mL of phenylmethylsulfonyl fluoride in 100 mM KH2PO4/K2HPO4 (pH 7.4). The lysate was incubated at 37 C for 2 hours, centrifuged at 8000 g, and the supernatant collected. A 10% (w/v) streptomycin sulfate solution was added to the supernatant at a final concentration of 1% to remove remaining nucleic acid. The solution was mixed at room temperature for 10 minutes and centrifuged for 10 minutes at 8000g. The supernatant was removed and 800 mL divided equally into 2 12 mL plastic centrifuge tubes. For each 1 mL of supernatant, 400 mL of 10-mM 3, 4-dinitrophenylhydrazine in 2 M-HCl was added to one tube and 400 mL of 2-M HCl to the other tube. The tubes were then incubated for 1 hour, and the protein was precipitated by adding an equal volume of 20% (w/v) TCA. The tubes were centrifuged at 8000g, the supernatants discarded, and the pellets washed several times with 1.5 mL of an ethyl acetate ethanol mixture (1:1) to remove excess 3, 4-dinitrophenylhydrazine. The final protein pellets were dissolved in 1 mL 6-M guanidium hydrochloride and the absorbance of both solutions measured at 280 nm and 370 nm as per Reznick and Packer (1994). Levels of 8-hydroxy-2’-deoxyguanosine (OHdG; JaICA, Shi- zuoka, Japan), lipid peroxide (Cayman Chemical, Ann Arbor, MI, USA) and 3-nitrotyrosine (Nitrotyrosine assay kit, Millipore, Temecula, CA, USA) were measured in cell extracts after 2e3 days of incubation. The protocols were the same as previously described measuring cell viability. Quantitation was performed with ELISA detection kits following protocols described by the manufacturer. The significance of differences between data sets was analyzed by 1-way or 2-way analysis of variance tests. Multiple group com- parisons were followed by a post hoc Bonferroni test. p values are given in the figure legends. We purchased small amounts (10 oz 1⁄4 approximately 280 mL) of coffee from 3 different companies and dried it completely at room temperature. Dried weights were found to average 140 mg. To assess the neuroprotective effect of various coffee constituents, we dissolved the dried coffee in sterilized water. We then added supernatants from stimulated THP-1 cells and U373 cells and incubated the mixture for 2 hours (final concentrations: 140 mg/ 280 mL 1⁄4 0.5 mg/mL). The stimulants for THP-1 cells were LPS/IFNg and for U373 cells, IFNg was applied for 2 days. The resultant CM from both THP-1 cells and U373 cells was transferred to RA-differentiated SH-SY5Y cells (experimental protocol 1). MTT assays were performed after 3 days. Data are shown in Fig. 1. 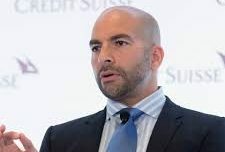 There were significant increases in SH-SY5Y cell survival after treatment with CMs from LPS/IFNg-stimulated THP-1 cells and IFNg-stimu- lated U373 cells that had been exposed to coffee and decaffeinated coffee. In coffee beans, the constituents most likely to exert anti- inflammatory and antioxidative function are caffeine, quercetin, flavonoids, and CGA as well as their derivatives (Kreicbergs et al., 2011). The amounts of the 4 compounds included in 100 grams of coffee beans are 280 mg for CGA, 200 mg for quercetin, 60 mg for flavones (a representative of flavonoids), and 40 mg for caffeine. We calculated the amount of each compound in 140 mg dried weight of coffee (CGA: 392 mg, quercetin: 280 mg, flavones: 84 mg and caffeine: 56 mg). We found that mixtures of the 4 components protected SH-SY5Y cells from toxicity of LPS/IFNg-stimulated THP-1 CM and IFNg-stimulated U373 CM just as much as both types of coffee (Fig. 1). The data indicate that the protective function of coffee beans must come almost entirely from these 4 compounds. Fig. 2. Effects of caffeine (CAF in X-axis), chlorogenic acid (CGA in X-axis), flavone (FLA in X-axis), and quercetin (QUE in X-axis) alone (10 mg/mL each) or their combination on SH- SY5Y cell viability changes mediated by (A) LPS/IFNg-stimulated THP-1 and (B) IFNg-stimulated U373 CMs. THP-1 cells and U373 cells were pretreated with each compounds or their mixtures for 2 h and were exposed to stimulants for 2 d. Then the cell-free supernatants were transferred to RA-differentiated SH-SY5Y cells (Experimental protocol 1). MTT assays were carried out in 3 d. Values are mean ` standard error of the mean, n 1⁄4 4. Two-way analysis of variance was carried out to test significance. Multiple comparisons were followed with post hoc Bonferroni tests. *p < 0.01 for LPS/IFNg-activated THP-1 (A) or IFNg-activated U373 groups (B) compared with control (CON) groups, **p < 0.01 for CGA and FLA groups compared with LPS/IFNg-activated THP-1 (A) or IFNg-activated U373 groups (B) or CAF groups, ***p < 0.01 for QUE groups compared with CGA and FLA groups, #p < 0.01 for CAF þ CGA and CAF þ FLA groups compared with CAF groups, ##p < 0.01 for CAF þ QUE groups compared with CAF þ CGA and CAF þ FLA groups, $p < 0.01 for CGA þ FLA groups compared with CAF þ CGA and CAF þ FLA groups, and $$p < 0.01 for CGA þ QUE, FLA þ QUE groups compared with FLA þ CGA groups. Note that quercetin was most potent anti-inflammatory and neuroprotective compounds in coffee components and caffeine was not effective. Abbreviations: CGA, chlorogenic acid; CM, conditioned medium; IFNg, interferon-g; LPS, lipopolysaccharide. THP-1 cells or IFNg-activated U373 cells and were then transferred to differentiated SH-SY5Y cells. MTT assays were performed after 3 days (see experimental protocol 1). It was found that CGA, flavones, and quercetin, but not caffeine, attenuated SH-SY5Y cell viability loss by THP-1 CM (Fig. 2A) as well as U373 CM (Fig. 2B). 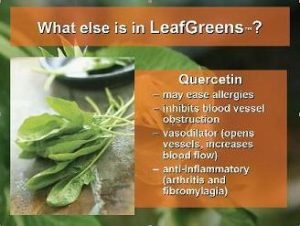 Quercetin demonstrated the most protective effect. It was also the most protective when it was added to any of the 3 other compounds. quercetin [p < 0.01 for quercetin group compared with CGA or flavone groups from 10 mg/mL and 2 hours preincubation (A), from 3 mg/mL and 4 hours preincubation (B), from 1 mg/mL and 8 hours preincubation (C), and from 0.3 mg/mL and 12 hours preincubation (D)]. At the shortest time interval of 2 hours and at the lowest concentration of 3 mg/mL, the protective effect of quercetin was minimal. But the toxicity was reduced to about half at a concen- tration of 1 mg/mL (p < 0.01 from 1 mM). By 12 hours the protective effect had increased to the point where the lowest concentration reduced the toxicity by about 1/4 while the highest concentration reduced it by about 4 fold. We also investigated the effect of supernatants from LPS/IFNg- stimulated microglia and IFNg-stimulated astrocytes on SH-SY5Y cell viability after treatment of both types of glia with the agents in coffee. Owing to the limited availability of microglia and astrocytes, we only examined the protective effects of quercetin against glial-mediated neurotoxicity. Caffeine was used for com- parison. Both microglia and astrocytes were pre-exposed to the compounds at only 1 time period (8 hours) before treatment with stimulatory agents (experimental protocol 1). For measuring SH-SY5Y cell viability, MTT assays were utilized. It was observed that both quercetin and caffeine reduced the toxicity of both LPS/ IFNg-stimulated microglia (Fig. 5A) and IFNg-stimulated astro- cytes (Fig. 5B) toward SH-SY5Y cells (quercetin: for microglia p < 0.01 compared with control at 0.1 mg/mL and for astrocytes p < 0.01 compared with control at 0.3 mg/mL; and caffeine: for microglia and astrocytes p < 0.01 compared with control at 10 mg/ mL). Again, quercetin had a greater neuroprotective effect than caffeine (for microglia: p < 0.01 compared with caffeine group at the same concentration [0.1 mg/mL] and for astrocytes: p < 0.01 compared with caffeine group at the same concentration [0.3 mg/ mL]). These data demonstrate that the effects observed with cultured microglia and astrocytes are comparable to those observed with the THP-1 and U373 cell lines. The table summarized the IC50 results of the studies in Figs. 3 and 4. Values are mean ` standard error of the mean, n 1⁄4 4. Two-way analysis of variance was carried out to test significance. Multiple comparisons were followed with post hoc Bonferroni tests. Note that there was a significant reduction in IC50 values between any pre- incubation time groups and that there was a significant reduction in IC50 values of quercetin compared with those of CGA and flavone in the same incubation time groups and of CGA and flavones compared with those of caffeine. the glial inflammatory response. In summary, quercetin, caffeine, CGA, and flavone were not toxic to the glial cells in the presence of inflammatory stimuli. The viability of SH-SY5Y cells treated with the CM from LPS/IFNg-stimulated THP-1 and IFNg-stimulated U373 cells was unchanged. Inflammatory stimulation of microglia or THP-1 cells causes them to release the inflammatory cytokines TNFa and IL-6 (Hashioka et al., 2007; Klegeris et al., 1999). Fig. 7 shows the effect on TNFa release of treatment of glial cells with quercetin and caffeine (100 ng/mL to 1 mg/mL for 8 hours before incubation). THP-1 release of TNFa (Fig. 7A) and IL-6 (Fig. 7B) and human microglial release of TNFa (Fig. 7C) and IL-6 (Fig. 7D) are illustrated. The release of TNFa (Fig. 7A) and IL-6 (Fig. 7B) was reduced by quercetin and caffeine in a concentration-dependent manner (for quercetin: p < 0.01 for 100 ng/mL or higher and for caffeine: p < 0.01 for 10 mg/mL or higher). The inhibitory effects of quercetin were more powerful than caffeine (p < 0.01 for 300 ng/mL or higher for TNFa and p < 0.01 for 3 mM or higher for IL-6). The pattern was similar in microglia (Fig. 7C and D). LPS/IFNg stimulation caused a 9.5-fold increase of TNFa and IL-6. Treatment with quercetin and caffeine reduced this release (for quercetin: p < 0.01 for 100 ng/mL or higher and for caffeine: p < 0.01 for 300 ng/mL or higher). For astrocytes, IL-6 is the main inflammatory mediator that is generated (Van Wagoner et al., 1999). Fig. 8 shows comparable data for IL-6 release from U373 cells (Fig. 8A) and cultured astrocytes (Fig. 8B). When cells were activated with IFNg, U373 cells and hu- man primary-cultured astrocytes release IL-6 (7-fold increase in U373 cells and 15-fold increase in astrocytes). However, both quercetin and caffeine reduced the release of IL-6 from IFNg-acti- vated U373 cells or astrocytes in a concentration-dependent manner (for quercetin: p < 0.01 for 100 ng/mL or higher in both cells and for caffeine: p < 0.01 for 30 mg/mL or higher in U373 cells and for 10 mg/mL in astrocytes). Again, quercetin is stronger in reducing IL-6 release than caffeine in both cell types (p < 0.01 for 100 ng/mL or higher in both). Fig. 5. Effect of pretreatment with caffeine or quercetin for 8 h on SH-SY5Y cell viability changes induced by (A) LPS/IFNg-activated microglial CM and (B) IFNg-activated astrocytic CM as followed by MTT assays. See experimental protocol 1 in Section 2. Values are mean ` standard error of the mean, n 1⁄4 4. One-way analysis of variance was carried out to test significance. $p < 0.01 for LPS/IFNg-activated (A) or IFNg-activated (B) groups compared with CON groups in each condition, *p < 0.01 for quercetin or caffeine groups compared with LPS/IFNg-activated (A) or IFNg-activated groups (B) #p < 0.01 for quercetin groups compared with caffeine groups at the same concentration. Abbreviations: CM, conditioned medium; IFNg, interferon-g; LPS, lipopolysaccharide. Fig. 6. Effect of treatment with caffeine, CGA, flavones, and quercetin on SH-SY5Y cell viability changes induced by LPS/IFNg-activated THP-1 cell CM (A) or IFNg-activated U373 cell CM (B) as followed by MTT assays. (A) THP-1 cells and (B) U373 cells. After THP-1 cells and U373 cells were stimulated for 2 d with LPS/IFNg or IFNg, respectively their supernatants were transferred to SH-SY5Y cells. Then caffeine, CGA, flavones, and quercetin were added. MTT tests were performed after 3 d (See experimental protocol 2 in Section 2). Values are mean ` standard error of the mean, n 1⁄4 4. One-way analysis of variance was carried out to test significance. Multiple comparisons were followed with post hoc Bonferroni tests where necessary. Note that there are no viability changes when all the compounds were exposed to SH-SY5Y cells after LPS/IFNg-activated THP-1 cell CM (A) or IFNg-activated U373 cell CM (B) were transferred. Abbreviations: CGA, chlorogenic acid; CM, conditioned medium; IFNg, interferon-g; LPS, lipopolysaccharide. Fig. 7. Effect of pretreatment with caffeine or quercetin on released levels of TNFa (A, C) or IL-6 (B, D) from LPS/IFNg-activated THP-1 cells (A and B) or LPS/IFNg-activated microglia (C and D). 8 h preincubation with caffeine or quercetin was performed before LPS/IFNg was exposed to the cells for 2 d. Values are mean ` standard error of the mean, n 1⁄4 4. One- way analysis of variance was carried out to test significance. $p < 0.01 for LPS/IFNg-activated groups compared with CON groups in each condition, *p < 0.01 for quercetin or caffeine groups compared with LPS/IFNg-activated groups, and #p < 0.01 for quercetin groups compared with caffeine groups at the same concentration. Abbreviations: IFNg, interferon-g; IL-6, interleukin-6; LPS, lipopolysaccharide; TNFa, tumor necrosis factor-a. incubation attenuated these increases (quercetin: 65%e75% decrease in both phospho-P38 MAPK and phospho-NFkB proteins, and caffeine: 30%e40% decrease in both proteins). Quercetin was again more powerful than caffeine (approximately 50%e60% less than caffeine, p < 0.01). IFNg-stimulated astrocytic CM. For these experiments, microglia and astrocytes were pretreated with 10 mg/mL caffeine and quercetin for 8 hours and then treated with stimulants (LPS/IFNg for microglia and IFNg for astrocytes). After 2 days incubation, microglial and astro- cytic CMs were transferred to SH-SY5Y cells. Levels of GSH and oxidative damages to DNA, proteins, and lipids were assessed in SH-Sy5Y cells. Data are shown in Figs. 10 and 11. Treatment with quercetin increased intracellular GSH levels by 37% (p < 0.01) but caffeine did not (Fig. 10). Exposure of SH-SY5Y cells to microglial CM and astrocytic CM for 3 days decreased GSH levels by 85%e90%. Quercetin, but not caffeine, attenuated this reduction (p < 0.01). Fig. 8. Effect of pretreatment with caffeine or quercetin on released levels of IL-6 from IFNg-activated U373 cells (A) or IFNg-activated astrocytes (B). 8 h preincubation with quercetin and caffeine was performed before IFNg was exposed to the cells for 2 d. Values are mean ` standard error of the mean, n 1⁄4 4. One-way analysis of variance was carried out to test significance. $p < 0.01 for LPS/IFNg-activated groups compared with CON groups in each condition, *p < 0.01 for quercetin or caffeine groups compared with LPS/IFNg- activated groups, #p < 0.01 for quercetin groups compared with caffeine groups at the same concentration. Abbreviations: IFNg, interferon-g; IL-6, interleukin-6; LPS, lipopolysaccharide. Fig. 9. Effect of pretreatment with caffeine or quercetin (10 mg/mL each) for 8 h on levels of phospho-P38 MAPK and phospho-P65-NFkB in LPS/IFNg-activated human microglia (A, left panel) and IFNg-activated astrocytes (A, right panel). Cell extracts were prepared and the proteins separated by SDS-PAGE. Representative blots are shown in (A) and quantitative results in (B). To ensure equal loading, the densitometric value of each band was normalized to the corresponding band for a-tubulin. Values are mean ` standard error of the mean, n 1⁄4 3. One-way analysis of variance was carried out to test significance. $p < 0.01 for LPS/IFNg-activated microglial or IFNg-activated astrocytic groups compared with CON groups in each condition, *p < 0.01 for quercetin or caffeine groups compared with LPS/IFNg-activated microglial or IFNg-activated astrocytic groups, #p < 0.01 for quercetin groups compared with caffeine groups. Abbreviations: IFNg, interferon-g; LPS, lipopolysaccharide. Fig. 11AeD demonstrates production of the oxidative damage products, 8-OHdG (A), protein carbonyl (B), lipid peroxide (C), and 3-nitrotyrosine (D). These products were substantially generated under normal conditions and were significantly reduced by quercetin (p < 0.01). Again, caffeine was not effective. When SH- SY5Y cells were exposed to microglial and astrocytic CM for 3 days, these damage products were increased (8-OHdG: 2 fold increase, protein carbonyl: 2-fold increase, lipid peroxide: 4.2- to 4.5-fold increase and 3-nitrotyrosine: 7.5- to 9-fold increase, p < 0.01). Treatment with quercetin attenuated the increase (8-OHdG: 35%e40% decrease, protein carbonyl: 35% decrease, lipid peroxide: 40%e50% decrease, and 3-nitrotyrosine: 40% decrease, p < 0.01). Caffeine was without effect. Fig. 10. Effect of pretreatment with caffeine or quercetin (10 mg/mL each) for 8 h on changes in levels of intracellular GSH concentration in SH-SY5Y cells induced by LPS/ IFNg-activated microglial CM and IFNg-activated astrocytic CM. Microglia and astro- cytes were pretreated with caffeine and quercetin and exposed to stimulants (LPS/IFNg for microglia and IFNg for astrocytes) 2 d. Cell-free supernatants were transferred to RA-differentiated SH-SY5Y cells. The cells were collected to measure the 4 damage parameters in 3 d. One-way analysis of variance was carried out to test significance. *p < 0.01 for quercetin groups compared with CON groups in normal condition, $p < 0.01 for LPS/IFNg-activated microglial or IFNg-activated astrocytic groups compared with CON groups in normal condition, and **p < 0.01 for quercetin groups in LPS/IFNg-activated microglial or IFNg-activated astrocytic CM treated condition compared with LPS/IFNg-activated microglial or IFNg-activated astrocytic groups. Abbreviations: CM, conditioned medium; GSH, glutathione; IFNg, interferon-g; LPS, lipopolysaccharide; RA, retinoic acid. a reduction in the risk of developing PD and AD in late life by developing the habit of drinking coffee in early midlife. Caffeine was assumed to be the active agent (Arendash and Cao, 2010; Eskelinen and Kivipelto, 2010; Hernán et al., 2002). However, this assumption was not supported by results of Ding et al. (2015), who found there was no difference in protective effects between caffeinated and decaffeinated coffee. These studies all assessed the protective effects over the long term. Such protective effects may not be revealed by short term studies. For example, Laitala et al. (2009) studied coffee consumption in 2006 middle-aged Finnish twins between 1975 and 1981. They found that coffee consumption over this 6-year interval was not an independent predictor of cognitive performance in old age. Similarly van Boxtel et al. 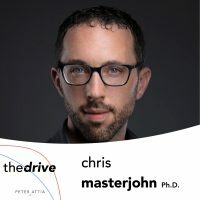 (2003) measured cognitive performance in 1376 individuals from the Maastricht Aging Study over the same 6-year interval. They found no significant difference in cognitive decline from ages 24 to 81. In this study, we have shown that quercetin, not caffeine, is the major constituent in coffee which inhibits glial-mediated toxicity against neuronal SH-SY5Y cells. In a standard cup of coffee, caffeine occurs in smaller amount than quercetin, CGA, and flavonoids (40 mg/100 grams of dried coffee) (Barone and Roberts, 1996). However, it needs very high concentrations to show anti- inflammatory and neuroprotective properties (at least 100 mg/mL in both THP-1 and U373 cells, Figs. 3 and 4). We found there was no significant difference in a coffee mixture of compounds with and without caffeine in our experimental condition (Fig. 1). This finding is consistent with the epidemiologic study of Ding et al. (2015). Quercetin protected against SH-SY5Y cell loss after exposure to LPS/IFNg-stimulated microglia and IFNg-stimulated astrocytes. The effect was concentration and incubation time-dependent (Figs. 3e5). Quercetin also inhibited activation of proin- flammatory pathways such as P38 MAP kinase and NFkB stimula- tion (Fig. 8). 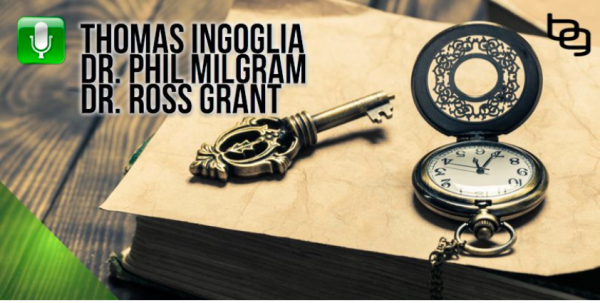 This led to a reduction in the release of proinflammatory factors such as TNFa and IL-6 from LPS/IFNg- stimulated microglia and their surrogate THP-1 cells and IFNg-stimulated astrocytes and their surrogate U373 astrocytoma cells (Figs. 6 and 7). It was demonstrated that caffeine has these prop- erties but only very weakly. The other major coffee components, CGA and flavones, are more effective than caffeine (Fig. 2). Quercetin also has antioxidative properties, which significantly increased intracellular GSH levels ([GSH]i) in SH-SY5Y cells under normal conditions. It also attenuated the reduction in [GSH]i in SH-SY5Y cells caused by glial CMs (Fig. 9). This phenomenon reflected a decrease in 8-OHdG, a biomarker of oxidative damage to DNA (Kasai, 1997) (Fig. 10). 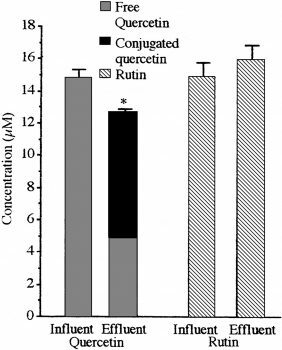 Quercetin also attenuated the increase in protein carbonyls, a general marker of oxidative damage to amino acids in proteins (Stadtman and Burlett, 1998). It reduced lipid peroxide, a product of the attack of reactive oxygen species on unsaturated fatty acids in lipids (Adibhatla and Hatcher, 2010), as well as 3-nitrotyrosine, a product of the attack of reactive nitrogen species such as peroxinitrite on tyrosine in proteins (Ischiropolous, 1998). Caffeine did not show any of these antioxidant functions. Previously, we reported that depletion of GSH in both microglia and astrocytes induces neuroinflammation and results in neuro- toxicity (Lee et al., 2010a). Therefore, it can be concluded that quercetin protected SH-SY5Y cells not only by reducing the release of proinflammatory factors from glial cells but also by inhibiting attack by reactive oxygen species/reactive nitrogen species in glial CMs. In our studies, we found that CGA and flavones also have anti- inflammatory and neuroprotective properties although they are weaker than quercetin (Figs. 2e4). It is possible that other unidentified coffee constituents could also exert antioxidative, anti- inflamatory, and neuroprotective effects via other mechanisms such as by anti-amyloid, anti-caspase, or other mechanisms. Chronic neuroinflammation is closely associated with the pathogenesis of several neurodegenerative diseases, including AD and PD (McGeer and McGeer, 2002; McGeer et al., 2003; Whitton, 2007). Quercetin is a readily available protective. It may have potential to be a useful therapeutic agent in AD, PD, and possibly other neurodegenerative disorders.